My great-grandfather, Robert Minor (1869-1943), was brought up on the family farm just outside the village of Garards Fort, Pennsylvania. Just down the red-dog Ceylon Lane stood the sturdy brick home of his Uncle Samuel (1825-1909) and Aunt Louisa (1832-1917) Minor. Sam and Robert’s dad, Marion Minor, were two of John P. and Isabella Minor’s sons, farming land purchased in the 1820s from the Myers and McClelland families. Sam and Louisa were married in 1852. In the next eighteen years, Louisa gave birth to eight children, three girls and five boys. Their eldest daughter, Isabella, died in childhood. But the rest lived to thrive into adulthood. At the time of this studio work, two boys, Jesse and John, had migrated to Taylor County, Iowa, where they settled among many other Greene County transplants. Three boys, Friend, Sam, and William, were finding their way in and around the farm, and the two girls, Mary Euna and Della, were still living at home. 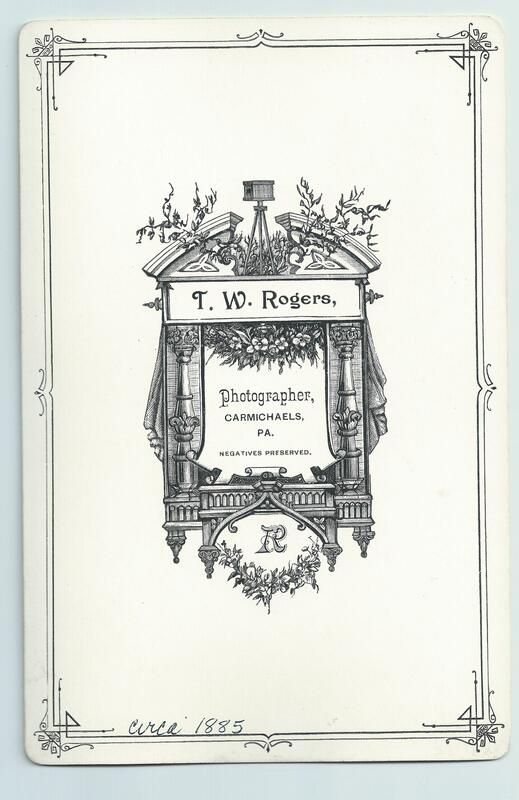 A teenage Robert would have known those cousins well, and would certainly have recognized Sam and Louisa as they are captured here in this set of 1885 portraits by Thomas W. Rogers of Carmichaels. Annotations by Marilyn Minor Strickland. 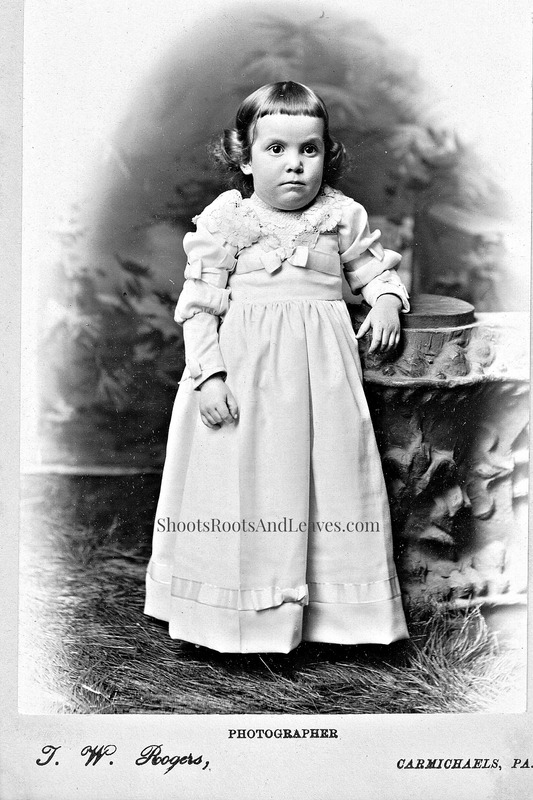 The Minor Family Album closes out with portraits of nine children, all taken between 1887-1894. I can identify, with confidence, only one face. Framed by short bangs and soft, baby curls, the chubby toddler’s brown eyes flatly state that she will hold this position but a moment longer. This is Flossie, christened Florence McClure in 1889 by her parents, Owen and Sarah Minor McClure. The puffed sleeve of the eighteen nineties makes an appearance in even this little one’s dress. Her bodice is embellished by a large lacy collar, and ribbon and bows adorn the bodice, sleeves, cuffs, and floor-length skirt. What a fabulous portrait! Florence McClure Titus, 1892-1893, Thomas W. Rogers, photographer, Carmichaels, Pennsylvania, . The Minor Family Album, page 22: Author’s Collection. Vintage photographs lead to vintage family. Folks that shared an historical context and proximity, whose connections of love and sorrow shaped decisions that are even now rippling through my time. I love looking at these eyes, windows to my past, staring back into my present. Thomas W Rogers of Carmichaels, Pennsylvania took this portrait of my great-grandfather’s birth family in the mid-1870s, when Robert Minor was about six years old. The faces of his parents bear distinctive features, which I make use of as I sleuth through other photographs. Like now, when we turn to pages eight and nine of the Minor Family Album. Marion Minor (1828-1913) His Roman nose was a strong facial feature. His right eyelid drooped noticeably. Mary Jane Gwynne Minor (1829-1908) Her most striking feature were her startingly light, and probably blue, eyes. 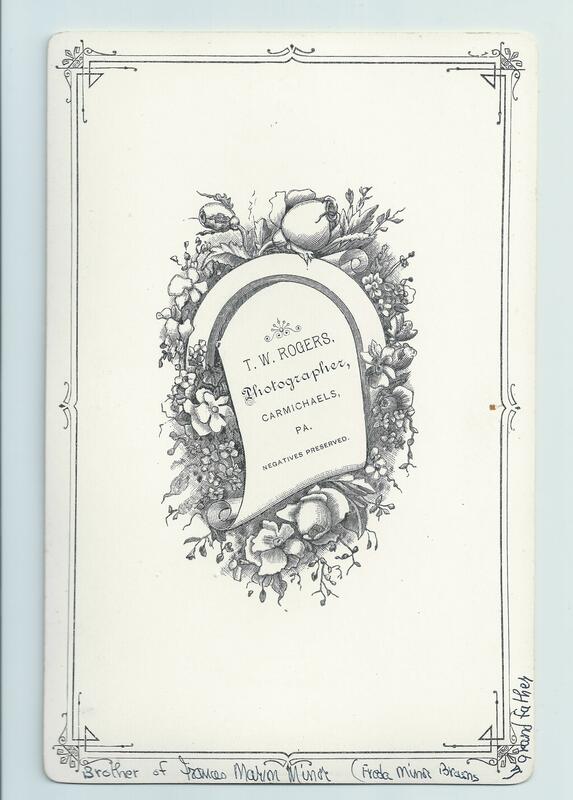 The photographs are mounted on heavy cardstock, with a metallic coating–silver or gold–on the beveled, scalloped edges, a product commonly used from 1880-the early 1890s. The two appear to be in their early sixties, suggesting a portrait sitting after 1888. The puffy fullness at the shoulder of Mary Jane’s dress narrows the timeframe to between 1889-1892. I imagine Mary Jane and Marion starting their day with the usual farm chores, milking cows, gathering egges, lighting the stove and fixing breakfast. Instructions would be given to Robert and the farmhands for the rest of the day’s chores, before the couple changed into their best clothes. A horse was hitched up to the buggy and they drove out onto the “red dog” surface, heading up the hill of Ceylon Road, past the homes of siblings and children, nieces and nephews, on their seven mile trip to Carmichaels. What was the occasion for the photographs? A sixtieth birthday acknowledged? Their fortieth wedding anniversary celebrated? Whatever prompted the impulse, I am grateful that the studio appointment was kept, and that I have these eyes gazing from my past. 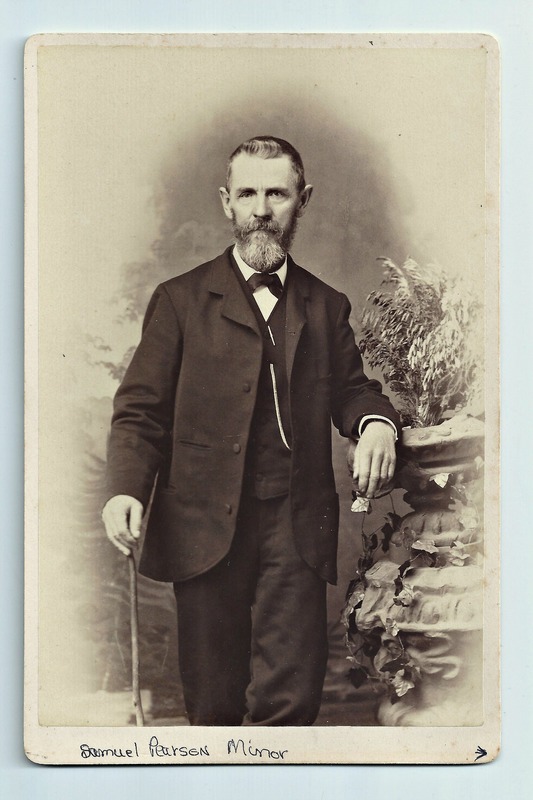 The second, third, and fourth pages of the Minor Family Album were all taken by Oliver Eugene Aultman, in his West Main Street studio, in Trinidad, Colorado. I made a thorough study of the photographs’ internal clues and narrowed down the timeframe for the shoot as being between 1889-1893. With no annotations to aid my identification, I turned to the internet and googled the photographer. This switch in focus may seem counterintuitive, but, as I reported here, perserverance paid off with an amazing, unexpected clue: the discovery of MY photograph in the online Aultman Collection shared by History Colorado. 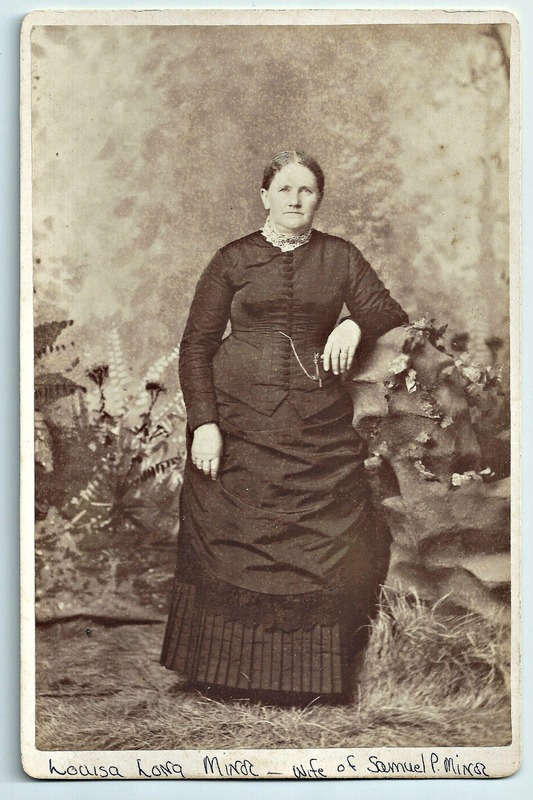 The online file confirmed that the photo had been taken in 1890, and the name associated with the woman was S. A. Stevens. Still means nothing to me. I found online copies Trinidad Directories from the 1890s and discovered that there was a Sanford H. Stevens living in Trinidad. I searched the digital Denver Library files and found an 1892 photograph of Sanford H. Stevens surrounded by his colleagues at the Trinidad Advertiser where he was business manager. Still no connection to me and mine. Damn the fire that destroyed the 1890 census! So relying on the 1850-1880 and the 1900 US Federal censuses, I reconstructed the life of this Sanford Stevens and found a sliver of a clue. Sanford Stevens was born in 1849 to Greenwood W. and Maria Stevens, farmers in Monongalia County, (West) Virginia. The family moved to Dunkard Township–just south of my family’s Greene Township home! !–by 1860. Sanford was listed as a school teacher in Dunkard Township in 1870, and must have married soon after, for the 1880 census has Sanford and wife, Phoebe, farming and raising two children in Monongalia County. Since they sat for a photograph in 1890, the family moved west sometime in the 1880s. By 1900, the Stevens family was complete, and Sanford and Phoebe were living on Colorado Avenue, Trinidad with four children, Clyde (1875), Frank G. (1877), Chellie M. (1881), and Mary E. (1884). So this is Sanford H. Stevens. And this is Phoebe Stevens. And, from left to right, these are Clyde, Chellie, Frank, and Mary Stevens. But. Why are these folks in the album? I googled my accumulated terms–Sanford, Stevens, Trinidad, history, Advertiser, newspaper–and hit upon a 1913 Semi-centennial History of the State of Colorado, Volume 2, by Jerome Smiley. Page three hundred and thirty was my perserverance reward, three glorious paragraphs describing Sanford H. Stevens’ family, employment, and public service. And most importantly yielding the golden ticket, the clue that solves my mystery. Sanford H. Stevens was married in 1873 to Phoebe H. Evans, daughter of Benjamin Evans. OH! I know that name!! That is THE connection. Benjamin Brice Evans was married to Margaret Minor and Margaret was the sister of Francis Marion, my great-grandfather. Mary Jane included these photographs because they were her niece’s family, folks who had successfully navigated their way to an exciting new life out west. With tremendous satisfaction, I introduce Phoebe Evans Stevens, the Minor link to Trinidad, Colorado.